One of the reasons many patients consult Doctor Jacono is that they tend to look like they are tired all the time. They are told by family, friends and colleagues at work that they look like they need some more rest, and that they look stressed even if they just had a great night sleep or even a vacation. In some cases, the upper eyelids can droop so much that it can hinder or obstruct their field of vision. Dermatochalasis, which is the growth of extra crepey skin that can droops over the upper eyelid. This is often referred to as hooded upper eyelids. Extra fat develops on the inner corner of the eye, in a pocket of fat called the medial or nasal fat pad. It often looks like a peas sized bulge. The forehead and brows fall which droops over the upper eyelids. Upper Blepharoplasty Before and After. This woman in her late forties wanted to lift her drooping cheeks and nasolabial folds and recreate a tighter jawline and get rid of her jowls. She had a mini facelift with a deep plane facelift of her fallen facial musculature. A short scar facelift incision was used so the incisions are hidden on the inside and behind the ear so the hair can be worn up with a ponytail. She has her upper eyelid lift and lower eyelid lift with a fat transposition to fill her under eye circles performed at the same. 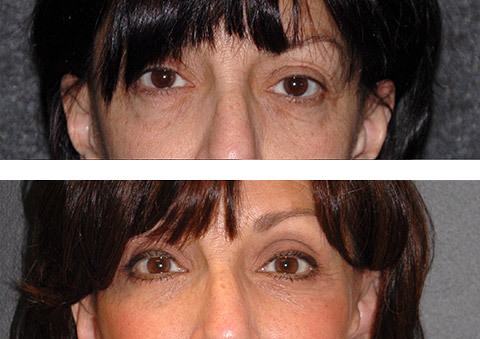 Upper Blepharoplasty Before and After. This patient in her late forties had heavy upper eyelid skin, an excessive medial fat pad, and lateral hooding that made her eyelids look tired. She underwent an upper eyelid surgery with preservation of her muscle and upper eyelid fat pads that make the eyelids look natural and not plastic. The incisions are not visible because of the tailored hidden incisions. To treat these patients, Dr. Jacono will perform an upper blepharoplasty procedure to tighten and remove the excess, hanging skin. 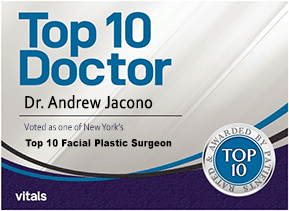 During the upper eyelid surgery, which is also referred to as an upper eye lift, Dr. Jacono will remove the excess skin, but he may also remove fat pockets in the upper lids that may be weighing the eyelids down. The forehead and brow dropping over the eyelids can act as a window shade hiding the eyes as well, so sometimes an endoscopic browlift is added to the procedure for better results. In some cases, it may be necessary to do both the upper and lower eyelids. 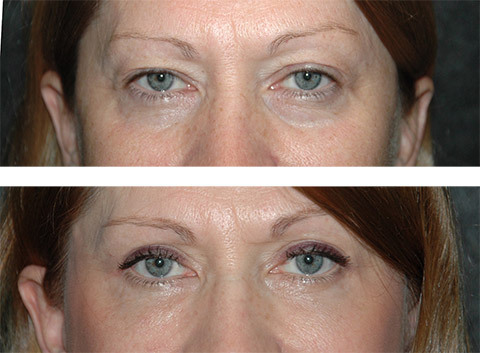 How is an Upper Blepharoplasty Performed? Upper Blepharoplasty Incision. The Eyelid Incision is placed in the natural upper eyelid fold called the supra-tarsal crease that heals seamlessly and is hidden when the eyes are open. It often needs to come out past the corner of the eye to catch extra loose skin that develops with advancing age. During upper eyelid surgery, Dr. Jacono will make a small incision in the natural folds of the upper eyelid called the supra-tarsal crease which are virtually invisible once they are fully healed. 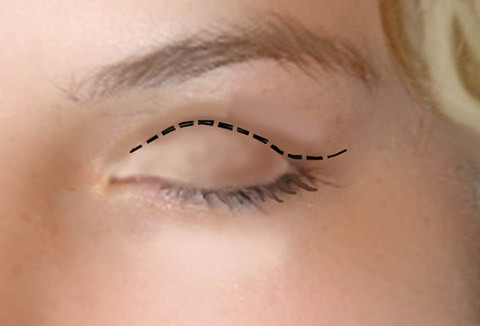 If you have hooding under the brow region past the corner of the eye, called lateral eyelid hooding, the incision needs to come out past the outer corner of the eye. Doctor Jacono believes that removing too much muscle and fat from the upper eyelid can create a carved out upper eyelid that loses the natural character and identity of the upper eyelid. To prevent this problem, he asks all his patients to bring in photos of their eyes from years past so he can recreate their personal youthful upper eyelid. Often patients do not have a deep-set eye, and the upper eyelid itself, called the tarsal platform show, is not visible much if at all in youth. Once he understands the proportion of your younger eye, he makes a plan to recreate it. Sometimes some of the excessive fat at the inner corner of the eye requires removal. Sometimes the brows were higher and require a mini browlift performed with an endoscope through small incision in your hair bearing scalp to elevate them slightly, again back to your youthful position. A carbon dioxide (CO2) laser may also be used to enhance the results by smoothing out any wrinkles and resurfacing the surrounding skin. 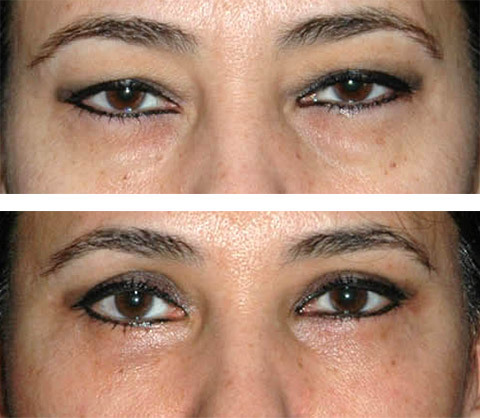 Upper Eyelid Lift Before and After. This patient in her late forties had excessive upper eyelid skin and wrinkling from excessive sun exposure. She underwent upper eyelid surgery to remove excess eyelid skin (called dermatochalasis) as well as laser resurfacing for eyelid skin wrinkles for complete upper eyelid rejuvenation. Upper eyelid surgery is easily performed with a simple local injection of novocaine like going to the dentist with minimal discomfort, and the procedure usually takes about a half an hour. Fat Transfer to Upper Eyelids Before and After. When eyelids become hollowed and sunken with age creating wrinkly skin, Doctor Jacono will perform a fat graft injecting fat from another part of the body. This creates smoother skin and restores a youthful look to the upper eyelids. Some patients have upper eyelids that become hollowed out as they age, making their eyes look deep set as the extra volume is lost. The ski looks crepey but does not hang, because the upper eyelids shrivel like grapes turn into a raisin. The answer here is not to cut the skin away but to add volume back into the upper eyelid skin by transferring fat back into this region using a fat graft injection from the body, for example the waist or thighs. This look also occurs when someone has had an overly aggressive upper eyelid lift removing too much fat, so it now needs to be replaced. What is a Functional Upper Blepharoplasty? When the eyelids begin to sag and hinder vision, a functional blepharoplasty will be considered medically necessary. The procedure to correct the sagging upper eyelids is relatively the same as the cosmetic version. This will help to correct the impaired vision that may be causing difficulties with driving or other visual tasks. 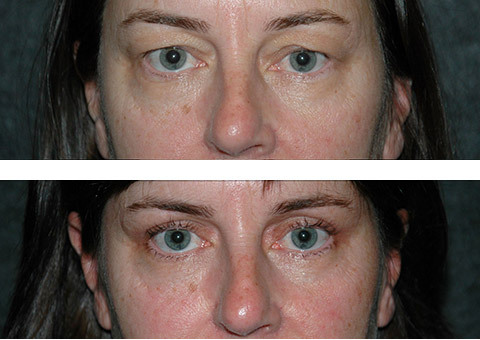 Functional Upper Blepharoplasty Before and After. Due to the heaviness of the upper eyelid skin this patient had weighing down of her upper eyelids that limited her vision. She had removal of her upper eyelid skin that opened her eyes up and improved her vision. Discomfort in the forehead region caused from the overuse of muscles that are constantly strained to lift the sagging eyelids. Eyelid irritation caused by excess folds of skin rubbing together. Men and women who are experiencing sagging eyelids may be a good candidate for eyelid surgery. To determine if you are a good candidate it is recommended to schedule a consultation with Dr. Jacono to discuss your issues and if a blepharoplasty is right for you. 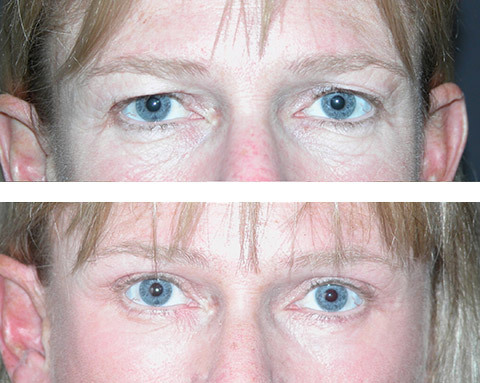 The recovery after upper blepharoplasty is quick, with most bruising resolving in just 4 days. At that point camouflaging makeup can be used to get back to work. 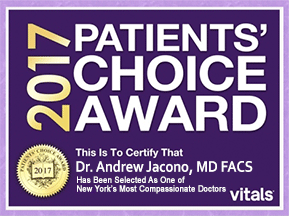 To learn more about upper eyelid surgery or to schedule your consultation with Dr. Jacono, you can call his New York City office at 212-570-2500, or his Long Island office at 516-773-4646. 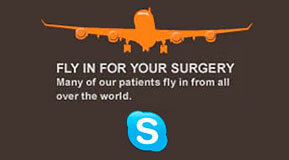 You can also complete an online consultation form to schedule your appointment.